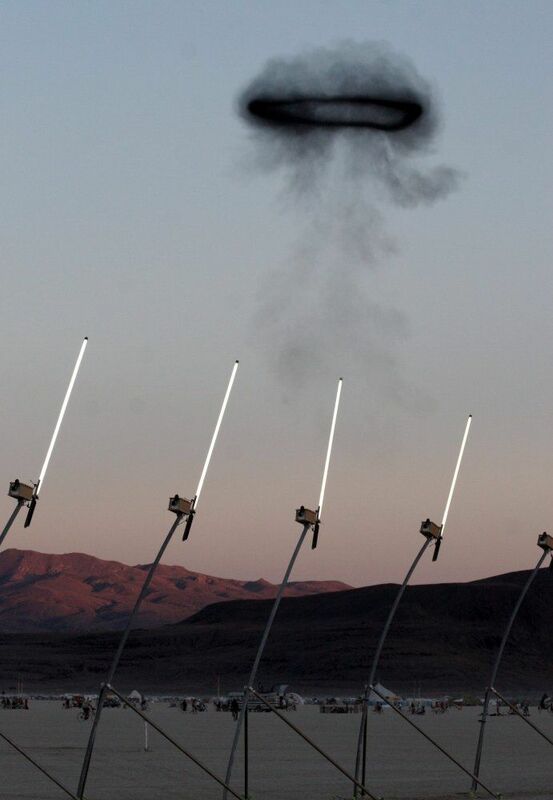 At Burning Man, beautiful synchronicities arise. Once when I was exhausted, I said to my friend Christie, "I wish we could ride in an art car." Two minutes later, a Chesire cat vehicle came cruising by. The driver stopped, gave us Vitamin Water, and let us relax on a sofa under his shaded roof until we felt restored. At that moment, I stopped trying to plan and allowed the adventures to unfold. Surrendering to the Universe, I was invaded by peace. There's a magical healing in watching things burn. The festival began in 1986, when Larry Harvey and a few friends took a wooden effigy of a man to Baker Beach in San Francisco and set in on fire. 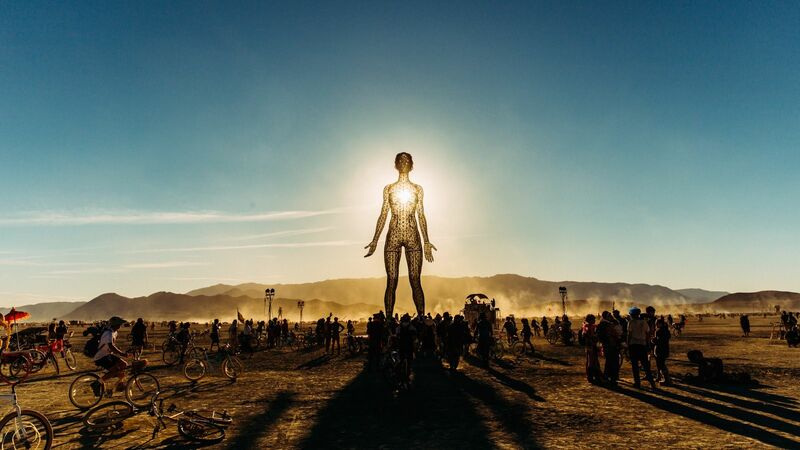 With that simple act of self-expression, the Burning Man founders tapped into something primal and universal: a desire to celebrate destructive forces as a way of clearing space for new life. Incinerate your unrealized dreams, past hurts and regrets. Make room for healing and love. 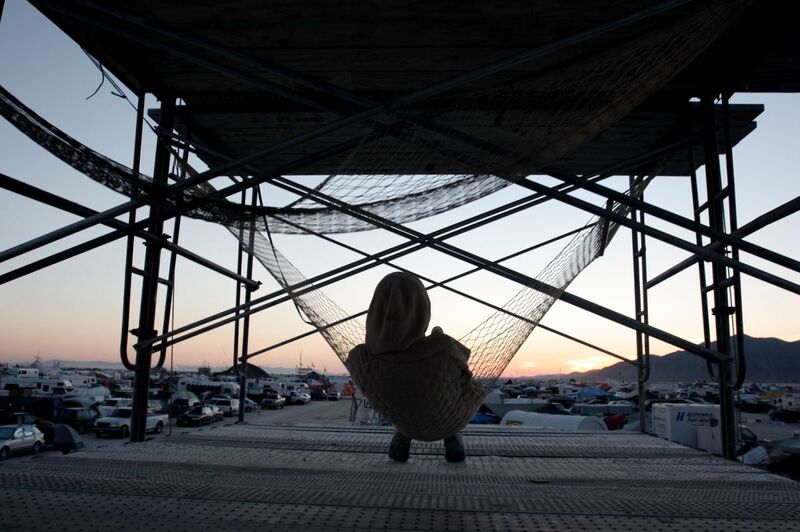 My first year at Burning Man, I was 28 years old and the Thunderdome camp traumatized me. Its members dressed up like characters from the Mad Max movies and tore around the playa in war vehicles mounted with fake guns. I hated it. Despised the violence. Wanted them to go away. But years later, I changed my mind. I did not have to judge. What they were doing was not "good" or "bad": It simply was. One of my top seven secrets for a more joyful existence is to experience awe on a regular basis. 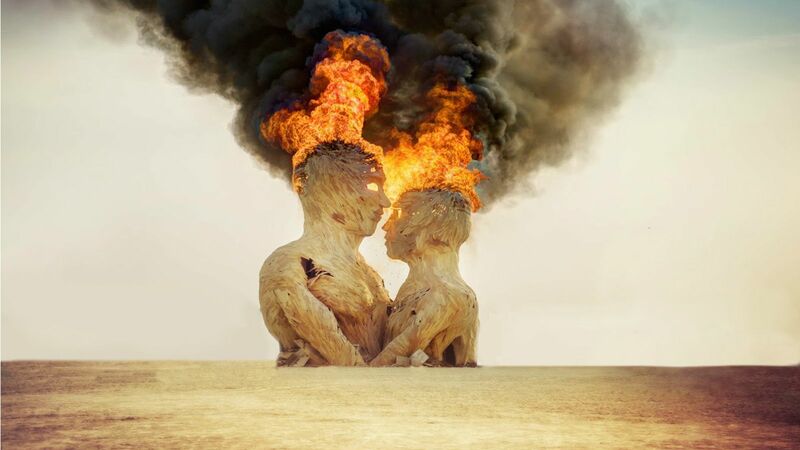 I walk around Burning Man constantly saying "Wow." Wow to the art: a seven-story tall oil derrick with oversized metal human figures bowing down to worship it. Wow to the generosity of total strangers offering to help you build your camp. Wow to free-spirited ambiance of the place. 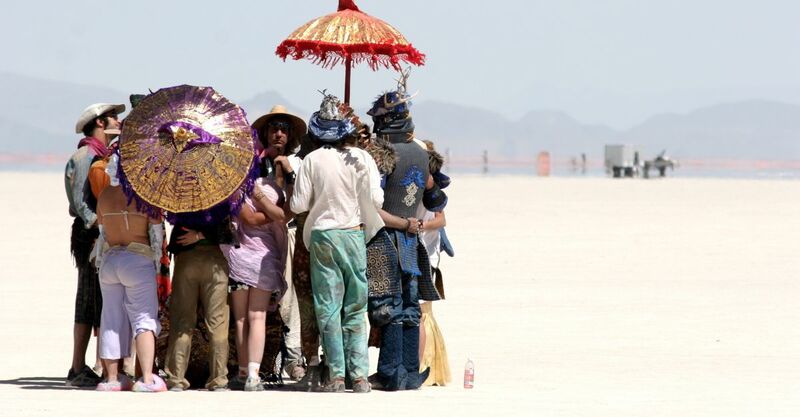 People who have never been to Burning Man often have the misconception that it runs on a "barter economy." It's true that there is no money exchanged on the playa (other than at Center Camp, where you can buy coffee and ice, with all proceeds going to the local community). But "barter" implies that you have to give something in order to receive it. 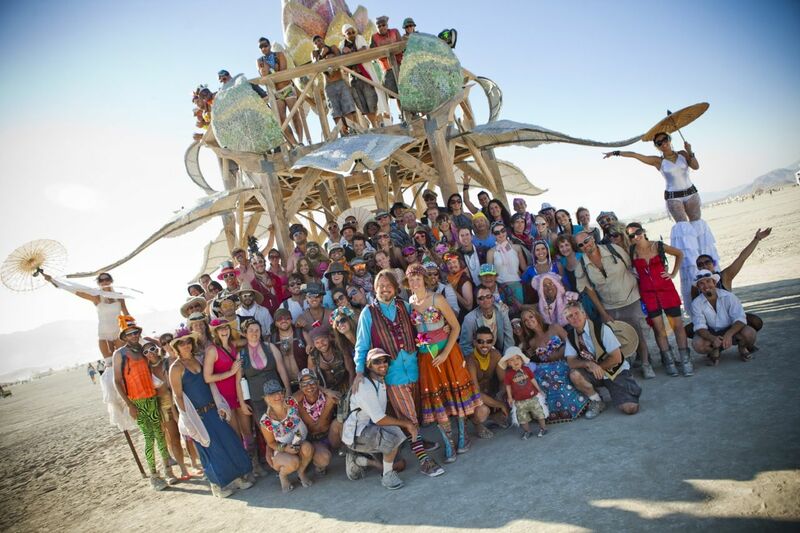 Burning Man is, in fact, a gift economy. People spend the entire week giving away marvelous objects -- soft serve ice cream cones and hot quesadillas, decorated dust masks -- as well as experiences -- massages, magic shows, yoga classes -- all of it for free. Some people bring their children to Burning Man. Others become children. The playa is filled with interactive art: a giant seesaw you can ride, a monkey zoetrope you can make spin about by riding a bicycle. When you arrive, you're also given a calendar packed with performance art, classes, events and activities. Explore it all. When you do, your inner child will crawl out into the bright sun, recalling the mysterious nature of the world. 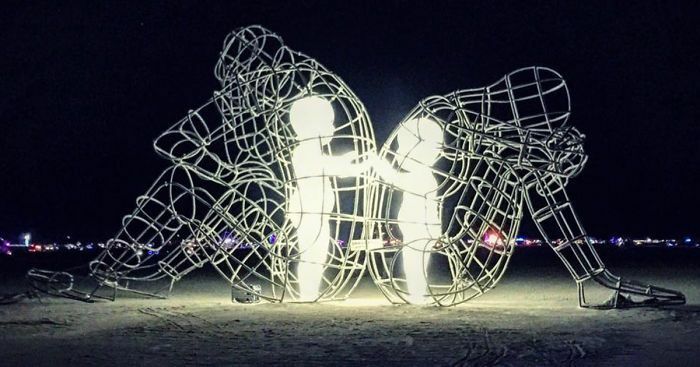 You often go to Burning Man planning to hang out with your friends. And that can be a remarkable experience. I took my 66-year-old mom last year, deepening our adult friendship. But if you open yourself to it, you can discover amazing new people. I've befriended every sort, from a CEO to a stripper to a permaculture gardener. The festival sets out to create a community. Open yourself to wondrous life-long connections. "Find an occasion to celebrate on the playa," suggests Jen, my best friend since college. I've been to a wedding, an annual tea party reunion of old friends and a 50th birthday party. Sometimes, in order to make especially sacred memories, you have to take yourself out of the context of everyday life. With its fantastical art, whimsical costumes and magical spirit, Burning Man provides an ideal backdrop. Two years ago, I took a wooden bracelet given to me by my ex-husband and tucked it into a corner of the Temple, the spiritual heart of Burning Man. There I wrote, “I forgive you, D. You loved me as best as you knew how.” The night the Temple burned, I watched its red-orange sparks flicker out into the blackness and realized that not only had I forgiven my ex; I had forgiven myself. You simply cannot be anything but present on the playa. Always another discovery, like a roller disco. Always a special someone to meet, like a drag queen or the Love of Your Life. Always a new activity to explore, like learning to chant the traditional Balinese monkey dance. 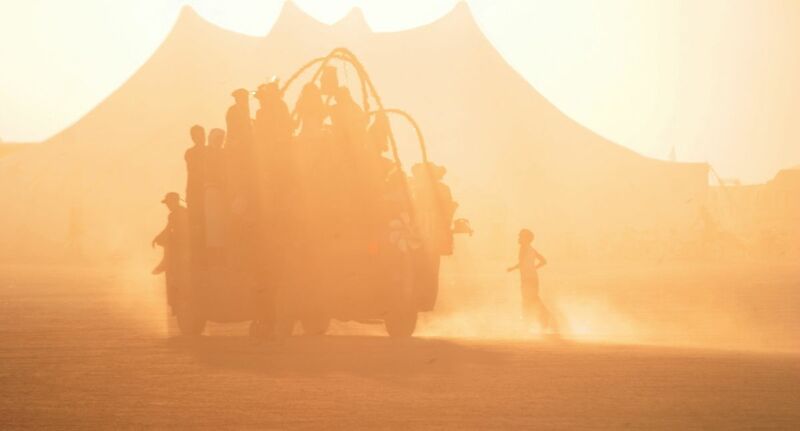 So if you find yourself in need of a reminder that it's okay to take a break and enjoy life, a desire to reconnect with your higher self, a wound to heal, or a message to send the world -- Burning Man might just be the place to do it.